Staff Sgt. Timothy Raymond McGill, 30, of Ramsey, N.J., died Sep. 21, 2013, of wounds received from small-arms fire in Paktika Province, Afghanistan. 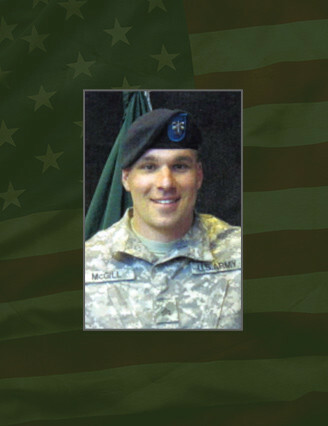 He was assigned to Company A, 2nd Battalion, 19th Special Forces Group (Airborne), Middletown, R.I., and was deployed in support of Operation Enduring Freedom. This was his second deployment to Afghanistan. McGill joined the Marines in Hawaii in 2001 as a machine gunner and was assigned to the 3rd Marine Division. He deployed with the 3rd Marine Div. in 2005. He joined the Rhode Island National Guard in 2008 and was assigned to 1st Bn., 200th Infantry Bn., as an anti-armor specialist. In 2011, McGill graduated from the Special Forces Qualification Course as a weapons sergeant and was assigned to A Co., 2nd Bn., 19th SFG (A) in Middletown, R.I.
His military education includes the Basic Airborne Course, Combat Lifesaver Course, Combatives Level I Course, the Survival, Evasion, Resistance and Escape Course, French Special Operations Language Training Level I, the Special Forces Qualification Course and Special Forces Advanced Urban Combat Course. McGill’s awards and decorations include the Army Commendation Medal, National Defense Service Medal, Iraqi Campaign Medal, Global War on Terrorism Expeditionary Medal, Global War on Terrorism Service Medal, Army Service Ribbon, Parachutist Badge, Naval Unit Citation, four Navy Sea Service Deployment Ribbons, two Non-commissioned Officers Professional Development Ribbons and the Special Forces Tab. He is survived by his parents and two sisters.